Professional Development TSCM Group Inc. (PDTG) and our Technical Security Branch (TSB) are pleased to announce the following company news items and informational updates as described below. If you would like additional information about our professional TSCM (debugging) services, products, software or operational capability please contact Paul D Turner, TSS TSI at 647-293-7384 at any time. Espionage, terrorism and cyber-attacks dominated the world of security in both information protection, personnel protection and facility integrity for the public and private sector. Just how serious are these threats? How is the west doing in identifying and neutralizing these modern-day realities? The various threats will be reviews with facts, figures, charts and details not reported in the media to crystallize the reality of security requirements now and in going forward. The goal of this presentation will be to help the professional in the room because the “smartest person in the room” to know the truth of what the west is facing in the future. To register for CTSC 2019 visit www.ctsc-canada.com or contact Gabriele Conflitti at gconflitti@pdtg.ca or Carol Fairbrother at cfairbrother@pdtg.ca for registration information. TSB FACT: Professional Development TSCM Group Inc., is the industry leader in bringing together professional level Technical Surveillance Countermeasures (TSCM) services, standards development, advanced training and certification, the management of longest running, technical security conference event in Canada, and the most respected leading industry Kestrel TSCM ® Professional Software, all under one operational umbrella; enhancing national security worldwide. "Innovation is simply the Beginning..."
Professional Development TSCM Group Inc., is pleased to announce the release of the second of three (3) new tactical workstations. The first was released in January 2019 referred to as the Tactical Spectrum Workstation (TSW) TM. The TSW TM is a powerful instrument style drop box for tactical deployment. The second platform is now available and is referred to as the Tactical Mobile Workstation (TMW) TM has been released ahead of schedule and the Tactical Command Workstation (TCW) TM will be released mid-March 2019 also ahead to schedule. The Tactical Spectrum Workstation (TSW) TM, Tactical Mobile Workstation (TMW) TM and the Tactical Command Workstation (TCW) TM are ruggedized computer platforms powered by the Kestrel ® TSCM Professional Software. All three (3) platforms will be demonstrated at the Canadian Technical Security Conference (CTSC 2019) at the NAV CENTER from April 02, 2019 to April 04, 2019. Visit www.kestreltscm.com for further information, or contact us across Canada (CA) and United States of America (USA) at 1-888-293-7384 to discuss your requirements. We are pleased to confirm that Team Kestrel ® will be running a 3-Day Kestrel TSCM ® Professional Software Certified Technical Operator (CTO) TM training program in London (UK) from Monday September 16, 2019 to Wednesday September 18, 2019. This training opportunity will take place at the Holiday Inn Express London located at 1018 Dockside Road, London, E16 2FQ. Please contact Paul D Turner, TSS TSI at pdturner@pdtg.ca for registration details. There are limited seats available for this program and interested participants are advised to confirm registration as soon as possible to secure space for this training opportunity on a first registered, first confirmed basis. This is an operator centric, instructor led CTO TM training program, and covers all of the key software standard and optional features from an operator's deployment perspective. Professional Development TSCM Group Inc., will be exhibiting at DSEI 2019 in the United Kingdom from September 10, 2019 to September 13, 2019. We are located in the US Pavilion, exhibit (N5-188). For detailed technical and sales information or government procurement questions, please contact Professional Development TSCM Group Inc., at support@pdtg.ca or by telephone at +1 647-293-7384 in Canada. Professional Development TSCM Group Inc., has posted the for download a new release v1.39-1 (Beta) drop file for use with the v1.38-15 (Installer). This Beta release adds the functional release of the NTSC video demodulation feature. 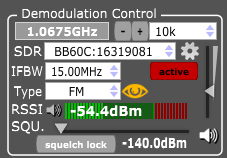 The video demodulation feature has single button activation, by tuning the signal of Interest (SOI) and pressing the Video Eye. The viewer can be resized from the default window size below to near full screen for amazing clarity. 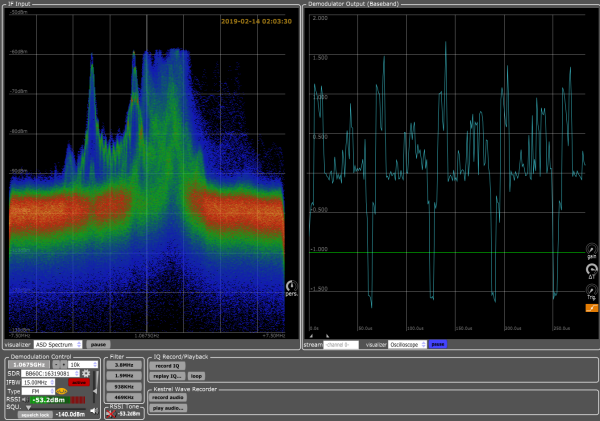 Our AUTO POLARITY (SYNC PULSE) feature combined with an operator invoked (force negative or positive sync) provides a measure of advanced operator control, and our powerful algorithm means less time tuning and quicker acquisition lock of hostile NTSC video signals. Video can be viewed live as an OTA signal or played back from either CSV or KIQ IQ files for a powerful analytical platform. Work is progressing on a number of innovative new tools and powerful features designed to enhance the technical operators ability to do the job quicker, easier and more efficiently. National Security is complicated and the Kestrel TSCM ® Professional Software brings clarity and order to mission driven requirements. 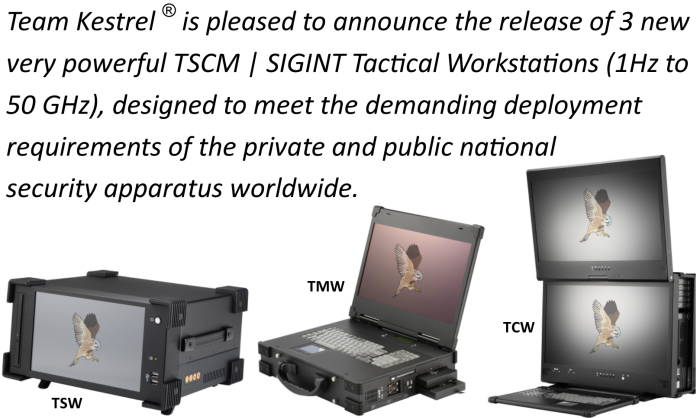 This edition of the TSCM Newsletter introduces the 2nd | 3rd configurations of the new tactical workstation series under the Kestrel ® umbrella. The Tactical Mobile Workstation (TMW) TM and the Tactical Command Workstation (TCW) TM are ruggedized computer platforms powered by the Kestrel ® TSCM Professional Software . 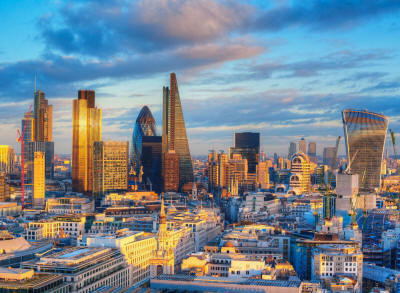 We are pleased to announce and confirm that Team Kestrel ® will be running a 3-Day Kestrel TSCM ® Professional Software Certified Technical Operator (CTO) TM training program in London (UK) from Monday September 16, 2019 to Wednesday September 18, 2019. There are limited seats available for this program and interested participants are advised to confirm registration as soon as possible to secure space for this training opportunity. Professional Development TSCM Group Inc., will be exhibiting at DSEI 2019 in the United Kingdom from September 10, 2019 to September 13, 2019. Our exhibit space is located in the US Pavilion (N5-188) and team Kestrel would be happy to provide information and a demonstration of our advanced TSCM | SIGINT | ELINT software running on a laptop computer or one of our new tactical workstations designed for the national security apparatus (public and private). The Kestrel TSCM ® Professional Software will take the stage front and center as the worlds leading national security, Software Defined Radio (SDR) resource, celebrating 10 years of powerful operator centric innovation since 2009. We have introduced several powerful new products all powered by the Kestrel TSCM ® Professional Software and industry leading advanced professional SDR hardware such as the Signal Hound BB60C and the SM200A radios. 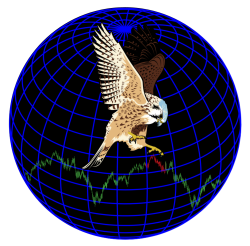 The Kestrel TSCM ® Professional Software is a powerful standards based application with strict adherence to the design and deployment methodology concepts within the TSB 2000 (Technical) Standard TM as developed around a modern moving target threat model. 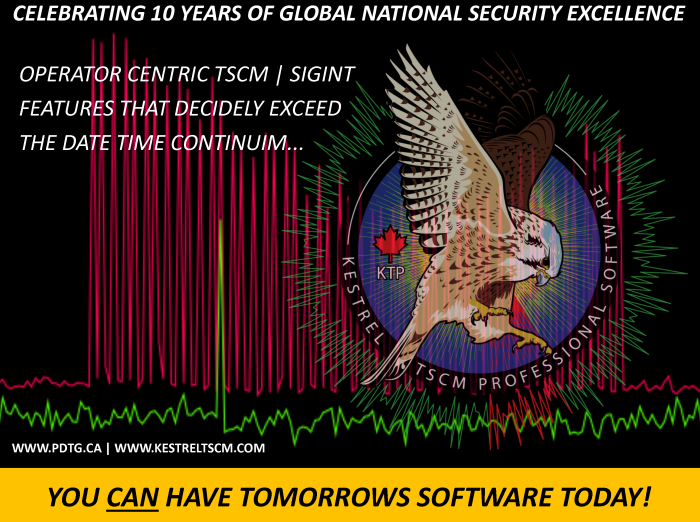 Kestrel TSCM Professional Software | 10th Anniversary! Since the initial announcement and subsequent release of our new Tactical Spectrum Workstation (TSW) TM we have receiver an overwhelming number of requests for information throughout the private and public, commercial and national security apparatus worldwide. The TSW TM will be formally introduced at the Canadian Technical Security Conference (CTSC) TM in Cornwall Ontario Canada running Tuesday April 02, 2019 to Thursday April 04, 2019. The Tactical Spectrum Workstation (TSW) TM is a highly transportable TSCM | SIGINT | ELINT | RSSM TM instrument, supporting any combination of up to three (3) on-board 4.4 GHz, 6 GHz, and 12.4 GHz Signal Hound SDR radios and any combination of externally connected radios with support up to 50 GHz. The TSW TM has a small operational deployment footprint with a large 10.1 inch touch screen technology paired with an incredibly powerful portable host computer capable of supporting the Signal Hound SM200A at sweep speeds of 1152 GHz per second in a dedicated SOLO priority mode. 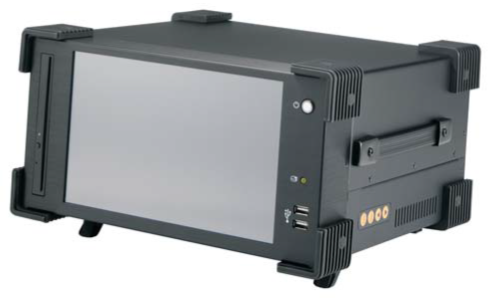 The TSW TM is PC based with the latest 8th generation i7 processor and 32 GB RAM, with up to 3TB of high write speed SSD storage media and is designed as a one touch power-up and comes configured with a powerful software application auto start sequence for super fast Kestrel Project File (KPF) TM programmability. 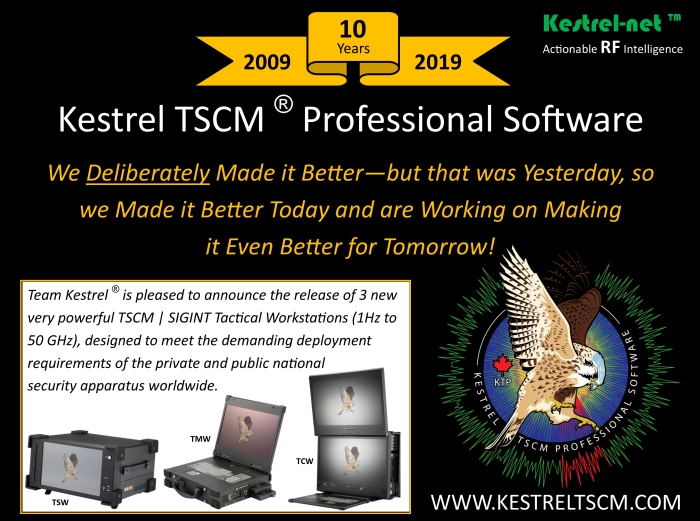 2019 marks the 10th year of the mighty Kestrel TSCM ® Professional Software and we are proudly celebrating an incredible decade of operator centric design and development of the leading standards based TSCM | SIGINT | ELINT | RSSM TM software as defined by the TSB 2000 (Technical) Standard TM. Visit www.kestreltscm.com for information, or contact us across Canada (CA) and United States of America (USA) at 1-888-293-7384 toll free to discuss your requirements. 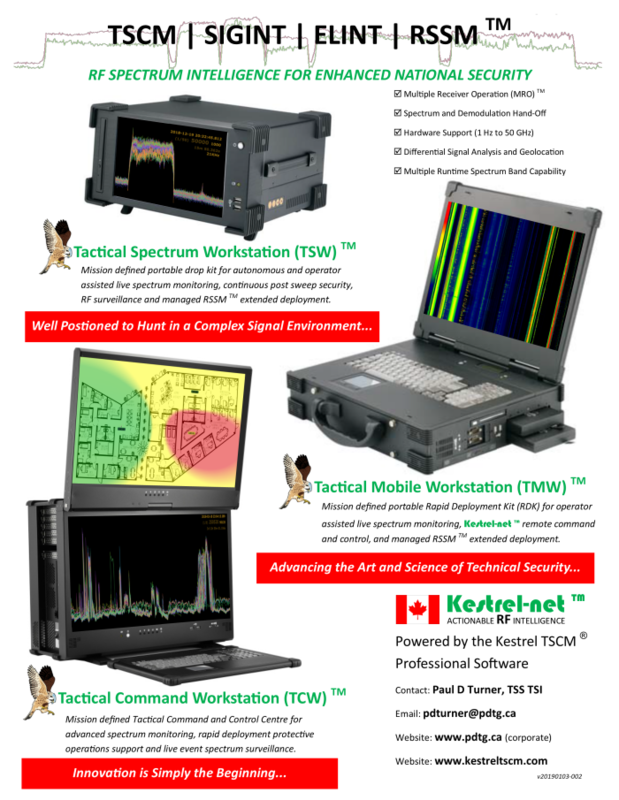 The Kestrel TSCM ® Professional Software is now available on a powerful new Tactical Spectrum Workstation (TSW) TM is a highly transportable TSCM | SIGINT instrument, supporting any combination of up to three (3) on-board 4.4 GHz, 6 GHz, and 12.4 GHz Signal Hound SDR radios and any combination of externally connected radios with support up to 50 GHz. The TSW has a small operational deployment footprint with a large 10.1 inch touch screen technology. Now you can have the leading TSCM software and an incredibly powerful portable host computer. 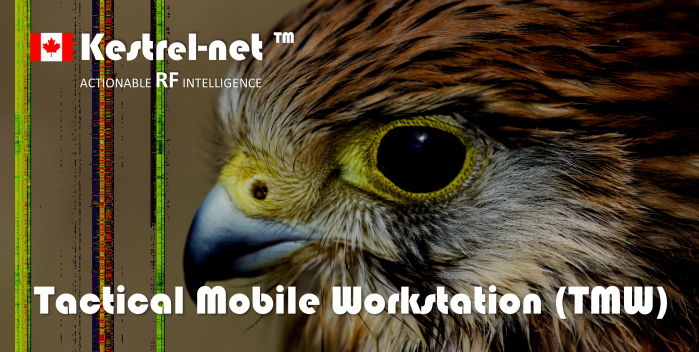 The TSW TM allows one (1) touch PC and application auto start for super fast Kestrel Project File (KPF) TM programmability. The ability to easily deploy an advanced multiple receiver geo-location solution at the facility level or across a wide geographical area, is fully supported by the TSW TM. We are celebrating 10 years of operator centric design and development of the leading standards based TSCM | SIGINT | ELINT | RSSM TM software as defined by the TSB 2000 (Technical) Standard TM. The January 2019 TSCM | SIGINT Newsletter is available for online viewing or download as a PDF format. The entire Kestrel TSCM ® team is very pleased to be able to celebrate 10 years of excellence in the design and development of the leading, standards based TSCM | SIGINT | ELINT | RSSM TM software. 2019 is a very special year for the Kestrel TSCM ® Professional Software. We are pleased to celebrate 10 years of end-user operator centric design and development of the worlds leading standards based TSCM | SIGINT | ELINT | RSSM TM software. Incredible value and enhanced by professional level features have continued to drive the Kestrel TSCM ® Professional Software to the status of the must talked about Software Defined Radio (SDR) solution when it comes to government, military, special forces and the national security apparatus. Throughout the early part of the year leading up to the Canadian Technical Security Conference (CTSC) TM, we will be rolling out three (3) powerful new system configurations and even more never before seen TSCM specific features and functionality at the application level. The new | TSW | TMW | TCW | tactical workstations are just the beginning. There will be additional announcements as the year progresses. 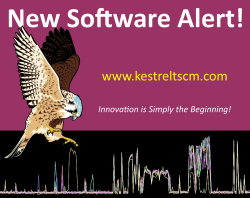 Kestrel TSCM Professional Software | v1.38-15 (Full Installer) Release Available! We have officially released the latest v1.38-15 installer file for the Kestrel TSCM ® Professional Software. All technical operators are encouraged to uninstall any older versions of the software and update to the latest installer release (v1.38-15) to advantage the many new software features, bug fixes and tweaks included within this official release. If you have questions about this release or about the new features, we are always here to assist with free technical support provided by our Canadian based software technical support professionals. Visit www.kestreltscm.com for information, or contact us across Canada (CA) and United States of America (USA) at 1-888-293-7384 to discuss your requirements.